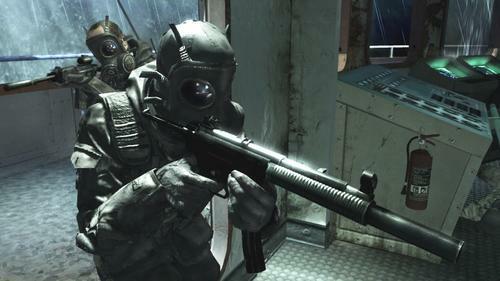 Call of Duty 4 is the latest in the best selling series of everyone’s favourite first person shooter. Only this time it is set in modern times with modern weaponry, and moves the game away from the usual and familiar World War 2 settings. The story is set in a fictional not too distant future war between the United States, United Kingdom, and a group of Russian Loyalists who are fighting against Russian Ultra nationalists and Middle Eastern rebels. The game is set over many locations ranging from the Middle East to Russia, and players will find that this game is much more slower paced than the games that preceded it. Weapons are varied and now include the M203 grenade launcher, M4A1 carbine, an MPSSD sub machine gun and my personal favourite, the FGM-148 javelin portable anti-tank guided missile. When you have a tank in your sights and press the trigger, the missile shoots off at speed, but goes straight up into the air. The first time you witness this you may think to yourself, what the ??? ?, but a few silent seconds later you will hear it coming down on its enemy, like a wife who finds out that her husband forgot their anniversary, yes it is that lethal. One other cool weapon that you get to play with is the AN/PEQ-2 Target pointer, which you can also use with your night vision goggles, yes you can now enter a dimly lit room and see that enemy soldier crouching in the corner just waiting for you. The entire game is done with a cinematic feel to it, with the introduction after the initial Tanker raid being more akin to a James Bond movie than a video game. The main selling point however, and the one that will keep players coming back for more, is the multi-player aspect that the game provides. As players accumulate points from defeating each other, the game will progress your rank which requires a set amount of points to obtain. The player is also rewarded, with a larger variety of weapons, weapon extras such as laser sights, and other game modes to play in. This really is the game that just keeps on giving and giving. The more you put in to it, the more you will get out of it. Call of Duty 4 is a must have title in our book. Since it’s release, we here at PS3 Pad find it hard put the game down, and even after completing it multiple times, it is the multi-player that seems to take over our lives. The game play, graphics and story have all been done to perfection, and whatever game comes along next branding the name ‘Call of Duty’, will have to be pretty special to improve on an already perfect game. Previous story New Lair Patch arrives!